Many of our clients are responsible for collecting and submitting sales taxes in many different counties and districts. We can assist your company in the compilation of information and preparation of sales tax returns in an efficient and timely manner. 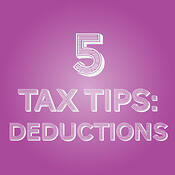 Here are five tips to help you properly itemize your deductions and minimize your taxes.